Are you never more than a few steps away from your PC and want to keep up with comments on your blog? Then here’s how you can stay on top of your WordPress comments right from your desktop. 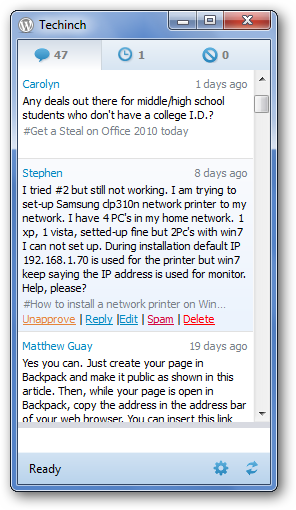 Wp-comment-notifier is a small free app for Windows that lets you easily view, approve, reply to, and delete comments from your WordPress blog. Whether you have a free WordPress.com blog or are running WordPress on your own server, this tool can keep you connected to your comments. Unfortunately it only lets you manage comments at one blog, so if manage multiple WordPress-powered sites you may find this a downside. Otherwise, it works great and helps you stay on top of the conversation at your blog. 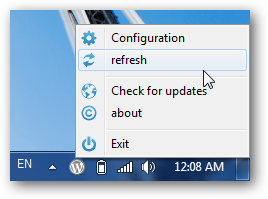 Download the wp-comment-notifier (link below) and install as usual. Run it once it’s installed. 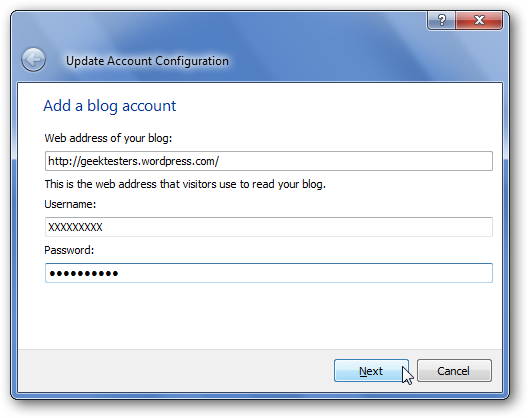 Enter your blog address, username, and password when prompted. 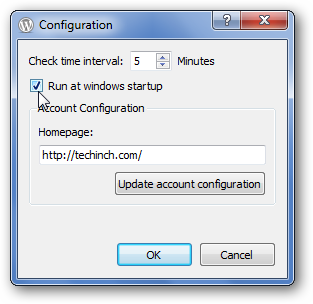 Wp-comment-notifier will automatically setup your account and download recent comments. 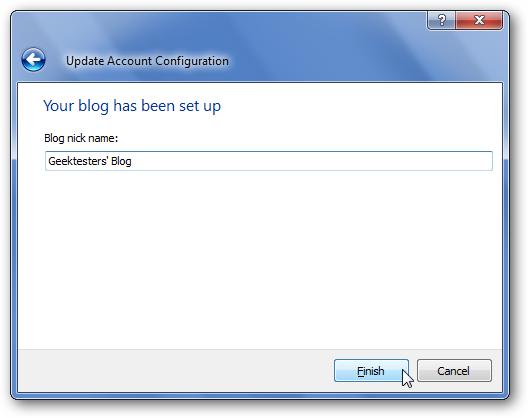 Finally, enter your blog’s name, and click Finish. You can now review your comments directly by double-clicking the new WordPress icon in your system tray. 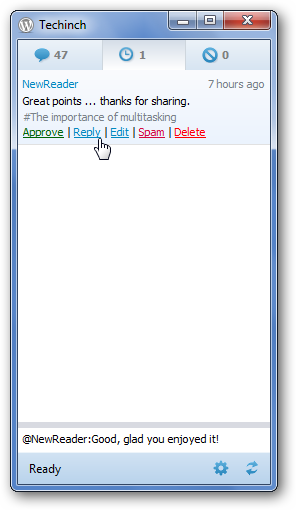 The window has 3 tabs…comments, pending, and spam. 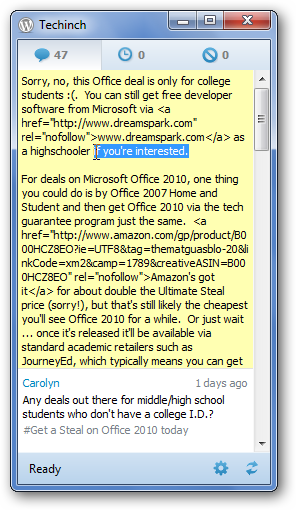 Select a comment to reply, edit, spam, or delete it directly from your desktop. 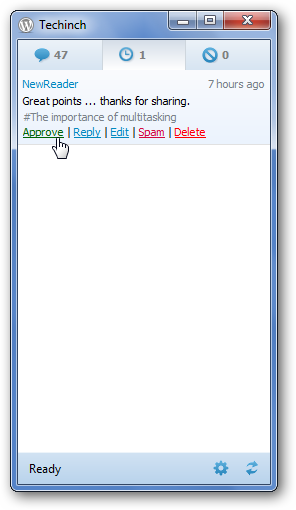 If you select Edit, then you can edit the HTML of the comment (including links) directly from within the notifier. 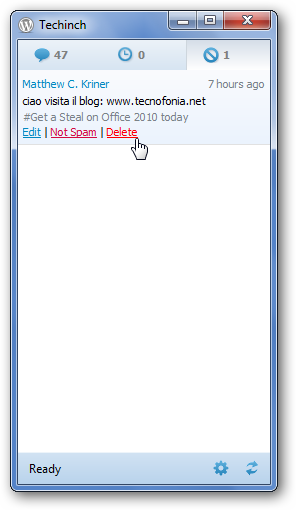 You can approve or permanently delete any spam messages that are caught by your blog’s spam filter. Whenever new comments come in, you’ll see a tray popup letting you know how many comments are waiting to be approved or are in the spam folder. Click the popup to open the editor. 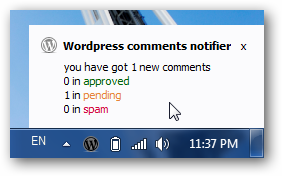 Now, you can directly approve that pending comment without going to your WordPress admin page. When you’re done, just press Enter on your Keyboard to post the reply. Or, if you want to reply to the comment, click the reply link and enter your comment in the entry box at the bottom. If you ever want to double-check if there’s any new comments, just right-click on the tray icon and select refresh. Finally, you can change the settings from the Configuration link in the tray button or by clicking the gear button on the bottom of the review window. 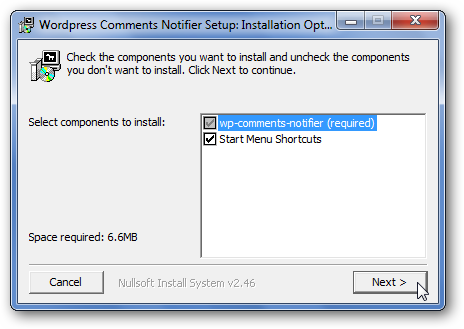 You can change how often it checks for new comments, not to start the notifier at system startup, and edit your account information. Whether you’re managing your personal blog or administer a site with millions of hits per day, staying on top of the conversation is one of the best ways to build and maintain your audience. With wp-comment-notifier, you can be sure that you’re always in control of your blogs comments. This app is especially useful if you review all comments before allowing them to be published.